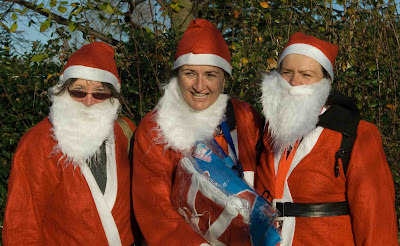 Three trim Santa's running through Hyde Park. No large jolly men here. There are so many Santa's in London in all shapes and sizes. How confusing for the children who believe in the chap in the red suit. Or do they anymore? Ho Ho Ho! Three Santas. So that's how he gets around every year. Too many Santas kill the true one.